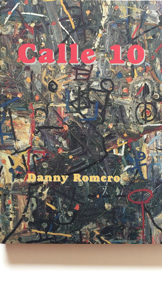 Calle 10 is the rich and beautifully rendered story of Zero, a young Chicano living on Tenth Street — Calle 10 — amidst the poverty and violence of Ciudad Jimenez, under the dark cloud of an oil refinery across the bay from San Francisco. This tough, gritty novel uncompromisingly brings us into the street violence, economic despair, and drug-induced stupors of Zero’s world, but the intelligence, honesty, humor, and compassion in Romero’s voice also convey Zero’s strength and wisdom. Danny Romero was born and raised in Los Angeles. He is now a professor at Sacramento City College, having previously taught at Camden County College in New Jersey and Temple University in Philadelphia. His poems and short stories have been published in many literary journals throughout the country, such as Colorado Review, Drumvoices Revue, Paterson Literary Review, Pembroke Magazine and Ploughshares. His work can be found in a variety of anthologies, including West of the West: Imagining California (1989), Pieces of the Heart: New Chicano Fiction (1993), Latinos in Lotusland: An Anthology of Contemporary Southern California Literature (2008) and Pow Wow: Charting the Fault Lines in the American Experience - Short Fiction from Then to Now (2009). He is also the author of the poetry collection Traces (Bilingual Review Press, 2012).